Saturday July 13th through Saturday July 27th: Ms Wood will be on SUMMER VACATION! Enjoy one of your favorite posts from the past until I return to entertain you! And thank you for your loyal following. In the 1990’s when I was signed to my first big recording deal with Hollywood Records, I was fortunate enough to have several of my all-time superstar favorite musicians want to play on my album. 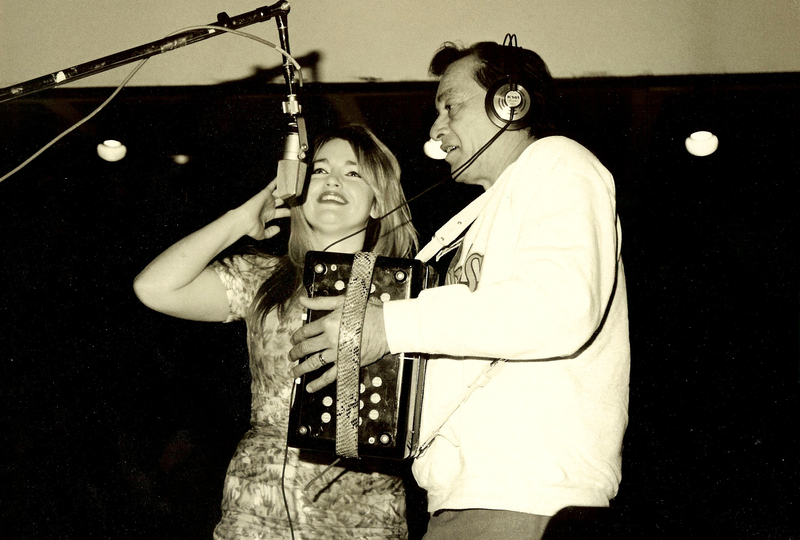 So, when my producer said that Flaco Jimenez from The Texas Tornados loved my song, I Wonder Why, and wanted to add his Tejano accordion stylings on the track, I was all in. I had never met Flaco, I had only admired his work as a fellow musician and a fan and so… the day that he first came to the studio… I was a bit shy. Lucky for me… Flaco wasn’t. In fact… Flaco is FAR from shy. He is actually a giant flirt but in a way that is so sweet and kind he could have basically said the crudest of things to me and I still would have looked at him and smiled like a starstruck school girl: He really is that charming. He showed up in old polyester grandpa pants and an over-sized sweatshirt. His hair smelled of Tres Flores and he reminded me of all of the men that I had loved growing up: greaser grandpas that worked on cars, had tool sheds with pin-up girl calendars on the wall, and always bought you that coca-cola you weren’t supposed to have right before dinner at the old school liquor store while picking up that cigar that grandma didn’t want him to smoke. For me it was love at first sight and for Flaco… it was love when he had a pretty girl standing next to him singing like a bird while he played along… at least… that’s what he said to me in his charmingly witty way. We ran through some takes and caught the feel of the music rather quickly and so the PR rep began to take the publicity photos. Flaco has a very thick Spanish accent and though I could understand most of what he was saying… I was a bit confused when he kept asking me to put my head on his accordion. I couldn’t figure out why in the hell he would want me to put my head on his accordion but… I figured if a musical great asks you to put your head on his accordion well… then you do it. I leaned over and laid my head against the keys. I put my head back down and pressed it against the keys again. The photographer stood mute… not sure how to handle the situation so he just stared at Julian hoping that his production skills went further than just musical instruction. I tried not to envision my “hand” on Flaco’s “instrument” as I reached over and pretended to play the keys on the accordion. Flaco put his hand next to mine, leaned in for a giant hug, and smiled big at the photographer waiting for the flash to snap. “Jesus,” I heard the photographer mumble under his breath. “You didn’t understand him either,” I snapped. And I couldn’t imagine what it would be like to meet the boys. Our first show together was at The Coachhouse and I wanted to bring them all gifts so… I talked to my A&R rep and we gave them each the best of the Disney swag: Solid gold Mickey Mouse watches in special collector cartoon tins. They were super cool gifts and though I was nervous to meet all the guys together, I was excited to give them to the band. I arrived for sound check, walked up the back stairs of The Coachhouse, and found the guys hanging out in the large Green room. Augie Meyers definitely looked the scariest. He has that old hard biker thing going and I swear if he had shouted at me I would have stopped and pee’d in fear on the spot. He eyeballed me up and down as he sat on the couch, one leg crossed over the other, arms splayed out over the backside of the couch cushions, as if he were sizing me up and deciding whether or not to like me. Freddy Fender looked up from re-stringing his guitar and smiled. He had always reminded me of a Latino Jerry Garcia, someone I had never seen as much of a threat, so I smiled back and gave him a bit of a wave. Doug Sahm, was the funny man of the group… he reminded me of Joe Walsh from The Eagles… always looking for some type of trouble and fun and so he shouted a big “HEY!” before Flaco rushed over and grabbed me. “This is D.D.” he said to the band, as if he were presenting them with a special gift, and when I saw Augie Meyer’s face light up, I knew that everything was going to be okay. They all stood up to hug me and shake my hand and I felt like I suddenly had my own personal gang of musical bad asses: men who would be more then willing to silence any type of idiotic heckler in the crowd. I knew it was going to be a beautiful series of shows and as I glowed in their presence… I handed them their gifts. You would have thought that they had never received a present from anyone in their lifetime. They were all overwhelmed with my thoughtfulness and Augie actually bent down and kissed my head, he seemed almost embarrassed to accept his watch but took it out of the case, admired it briefly, before putting it on and preparing to sound check for the show. That night both our sets went off without a hitch. We played to a sold-out crowd and woke up to stellar reviews. It seriously felt like my life couldn’t get any better and the warm feeling continued until later that night when I watched Freddy Fender giving an interview on television. He was in the middle of talking about the tour when his microphone kept clinking against something in his pocket. I looked at his wrist: no watch. I looked back at his hand: tin full of needles. God I hoped people heard the diabetic part and weren’t already sending me hate mail about how I was enabling the habit of “Mr. Wasted Days and Wasted Nights” and basically trying to kill off a living legend. My husband who was watching the show with me looked over and laughed out loud. “He liked the tin. He isn’t wearing the watch,” I said with a pout. I gave him a skeptical look. My next show with The Tornados, I walked up, grabbed Freddy, and pulled the tin from his pocket. Freddy actually rolled his eyes. I could only imagine what was going to happen next but I led Flaco to my mom and watched from the stage, trying to concentrate on my set, as Flaco flirted and laughed with my mother. I couldn’t stop myself from wondering what it would be like to have Flaco as my step-dad and The Texas Tornados as regular visitors at my household. I smiled at the thought as I finished my last song and bowed to the crowd. “He seems to really like your mom,” Augie said from the wings as I unplugged my Fender and walked off the stage. “Is that a good thing?” I asked. Augie shook his head and laughed. Doug walked up behind us and said, “You might need a drink child.” Which was a pretty serious statement from someone very much clean and sober at the time. But Flaco, was a perfect gentleman. He kissed my mother’s hand at the end of the night and she road home with me charmed as everyone was by Flaco’s attention. I played several more shows with The Tornados before we parted ways. Several years later Doug was gone… Freddy was too…. and I think of Augie and Flaco and miss our time together… and in my heart I am so grateful that I had my moment with the Godfathers of Tejano, these Kings of country music.